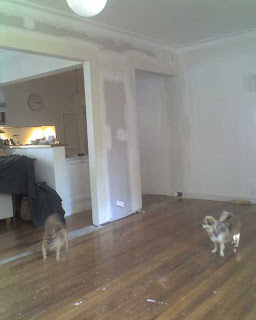 This photo shows the newly reduced wall between the kitchen, dining room and loungeroom. The lounge is a strange sort of shape and is quite small, so opening it up by making the dividing wall a little smaller, seems to create the illusion of a larger room. 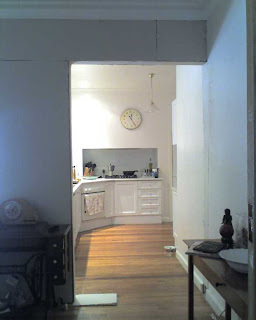 This photo is from the lounge looking through to the kitchen with my new bench tops and cook top in the alcove. These were taken on my mobile phone when my camera was out of action. When I bought the house there was no heating and no insulation, so you can imagine just how damn cold it was! I moved in in the middle of Winter, so the cats and I slept on a mattress on the lounge room floor under two doonas! All the walls through the house were painted a lemony yellow...quite bright it was too. The kitchen was black and yellow, with a bit of white thrown in...not nice, unless you're a Richmond supporter. There was no dining room and no study, so I had them built on. The ceilings right through the house were sagging terribly and needed replacing, so that's what I had done. I thought I'd be able to live with the crackly fibrous plaster walls, but they eventually had to go too. Ahh if I'd known then what I know now.....famous last words. After replacing the ceilings and installing all lovely new cornices, as well as putting insulation right through, we then decided to replace the walls. The task was how to do it without completely destroying the cornice. We got there...just... A big job, but it gave us the opportunity to put insulation in all of the walls and get some in the ceiling too ... then I had the floors done again, just to tidy them up a bit. This house, like many others, is a work in progress.... a money pit. But I love it and I love the transformation we've been able to make.